Wide selection offered to fit any kayak or boat angler’s needs. RAILBLAZA® USA offers a wide selection of rod holders to fit any kayak or boat angler’s needs. The Rod Holder II, Rod Tube and Rod Holder R provide a convenient spot to secure fishing rods while actively fishing or trolling. 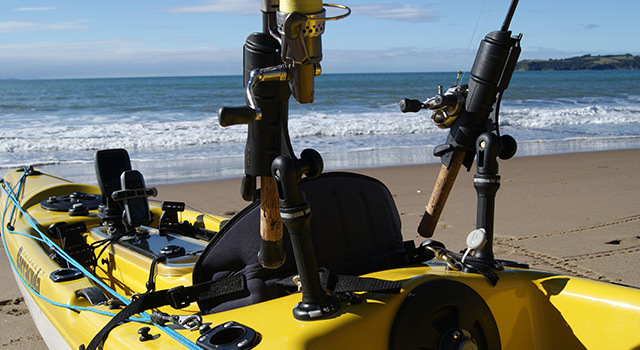 The rod holding solutions from RAILBLAZA easily reposition to meet current conditions, hold varying types of reels and are compatible with the full range of RAILBLAZA bases to mount on a kayak or boat. The RAILBLAZA Rod Holder II sets the standard for rod holder performance and features. The design includes a rotating collar that will accommodate any type of reel and helps prevent “strike-theft.” A rear, drop-down gimbal lock reduces rod rotation and allows for both freshwater fishing and offshore trolling in both kayaks and boats. The Rod Holder II is fully adjustable for 360 degrees around and more than 90 degrees vertically. After requests from anglers who wanted a solution to keep reels elevated and out of the splash zone, the RAILBLAZA Rod Tube was designed to offer the ability to keep the reel high and dry or flip down the gimbal to lock down an active rod. The wide Rod Tube will accept spinning and baitcaster tackle, and is perfect for large diameter sport reels used to haul in hard-fighting species. Designed as a rod rest, the RAILBLAZA Rod Holder R accepts spinning, baitcaster or fly combos. The stretchable strap at the front of the holder firmly keeps rods in place. The lightweight rod holder is best suited for freshwater and inshore fishing. Each Rod Holder R comes standard with a StarPort HD base and stainless-steel mounting hardware for kayaks and boats.